England manager Martin Johnson has warned Danny Cipriani that he would be jeopardising his international future were he to complete a proposed move to the Melbourne Rebels. Cipriani, the Wasps fly-half, is out of contract with the Premiership club in the summer and reports this morning suggested he had decided in principle to accept an invitation to join the Australian franchise that will enter an expanded Super 15 competition next year. Rebels representatives Rod MacQueen and John Connolly approached the 22-year-old Cipriani last week as part of aggressive recruitment drive. But should he opt for move Down Under then he would be unavailable for the 2011 Six Nations due to a fixture conflict which would rule him out of Johnson's plans for the Rugby World Cup later the same year. Asked whether it would be possible for Cipriani to remain part of the elite squad when based in Melbourne, Johnson said: "No of course it's not. The seasons are the same. They are playing through February and March so he wouldn't be available for England during the Six Nations. "It is his choice. If he wants to do that, it is up to him. It is impossible for him to play for England in the Six Nations if he is over there. I am sure he understands that." Earlier reports suggest that Cipriani had decided on the shock switch as he had been told there was no future for him in Johnson's England set-up. But Johnson has since insisted that his relationship with the player had not broken down. But Johnson admitted he had made no effort to speak to Cipriani or persuade him to stay. "I am aware of the situation but I have not spoken to him directly about it," said Johnson. "All I have heard are rumours that he could be signing. 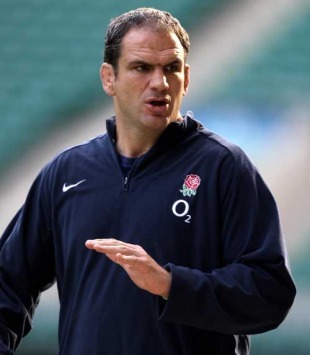 Until there is anything concrete he is in the Saxons team in Italy." Cipriani exploded onto the international scene during the 2008 Six Nations and was rushed straight back into the England side for the 2008 autumn internationals after recovering from a gruesome ankle fracture. But Cipriani struggled for form and was dropped to the bench after three Test starts and he then fell off the radar altogether. Rumours abounded that Cipriani had fallen out with the England management amidst a clash of personalities and a reported training ground bust-up and although these have been denied by both sides, Cipriani won the last of his seven caps 14 months ago. Macqueen believes Cipriani would be well suited to Super Rugby - but he he insists reports that contract talks have already begun are well wide of the mark. "It's more speculation than fact, and there's no doubt we've spoken to a number of players over in England and were really going through a sorting-out process to see where our priorities lie," Macqueen told Sportal. "But it's still very early days and it'd be premature to suggest that we would be offering him a contract. I think that the speculation's been kicked up a lot more than it deserves at this stage." The Rebels are permitted to sign up to 10 overseas players for the 2011 season - eight more than the four existing Australian teams - in a bid to ensure they are competitive in their debut season.